Following the great depression, national strikes and the other issues that so greatly affected the economy of the UK in the 1920s, a programme of national road building was instigated. In some areas, roads were already being started in 1928-9, but in Scotland things were a little slower to get underway. The A82 across Rannoch Moor was probably in planning when the thirties dawned, but it was not until 1931 that construction is recorded to have got under way, with the road opening to the public in 1932-3. Unlike all previous routes across the moor, it seems that the 1930's rebuild did not start to the south. The modern route from Altnafeadh through to Loch Leven was constructed in 1929-30 and open before work started on the moor. The most likely explanation is that it was an easier job, and so progressed from plan to reality quicker. From Ballachulish Ferry, the onward route to Fort William was not completed until 1933, while the route to Oban has bridges dated 1939 along it. Either way, work was underway in spring 1931, with the road taking a completely new alignment for the 10 miles from Bridge of Orchy to the Kingshouse Hotel and then roughly following Telford's route as far as the Coe Bridge near The Clachaig Inn. The road as built was a standard 1930s two-way single carriageway, perhaps as wide as 5.5m (18 ft). The bridges are certainly not much wider than this. Over the years with subsequent resurfacing and improvement projects, the width has grown in several places, slowly encroaching on the verges until the modern width of 7.3m (23 ft) has been reached in places. There is, however, little regularity in the width as can be seen by following a lorry along the road. In places the wheels meet the verge and centre lines, while in others there is space on either side. Anyone living along the route will be aware of the current A82 upgrade campaign, and while this is focussing on the narrow twisty sections along Loch Lomond and Loch Linnhe, the aim is to provide a full 7.3m carriageway from the Balloch Roundabout on the edge of Glasgow to Inverness. This would include overtaking / climbing lanes at regular intervals across the moor and a major realignment of the hairpin just to the north of Bridge of Orchy. To date, the Scottish Government has only made vague promises to 'upgrade' the A82, with no details forthcoming. This page will be updated if any more news appears! 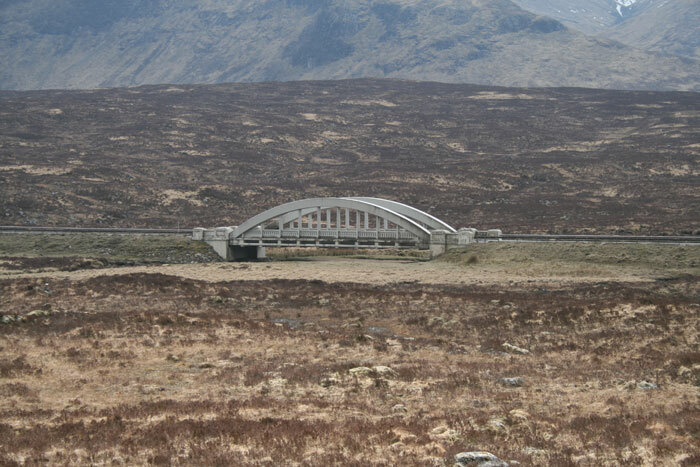 The route from Bridge of Orchy immediately diverges from any previous roads across Rannoch Moor, simply as the modern road does not use the bridge. Instead, it takes a wide loop around the eastern side of Loch Tulla, initially on the alignment of the estate track that leads to Achallader Farm. The records suggest that this road was heavily improved in the 1880s and 90s when the construction of the West Highland Railway was underway, providing access to the various works along the line. 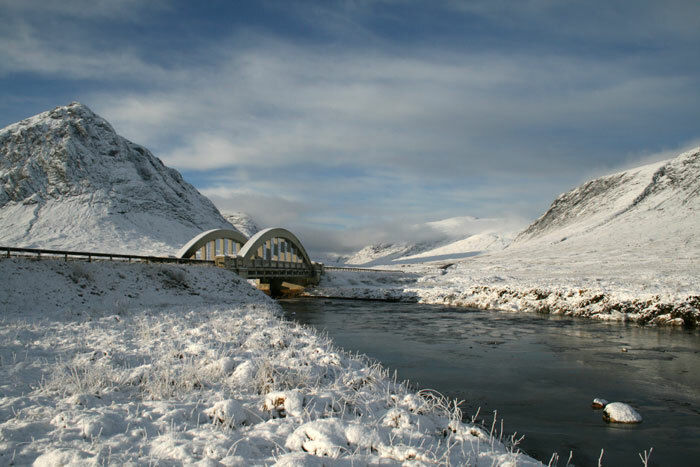 After diverging from the Achallader road, the modern route takes a long straight section across the lower moor, crossing the River Orchy at the further end on one of the magnificent bridges that are familiar to any travellers along the route. A huge hairpin then climbs the hill onto the upper moor, where the road passes between Lochan na h-Achlaise and Loch Ba, as opposed to the older routes which ran to the west of the lochan. 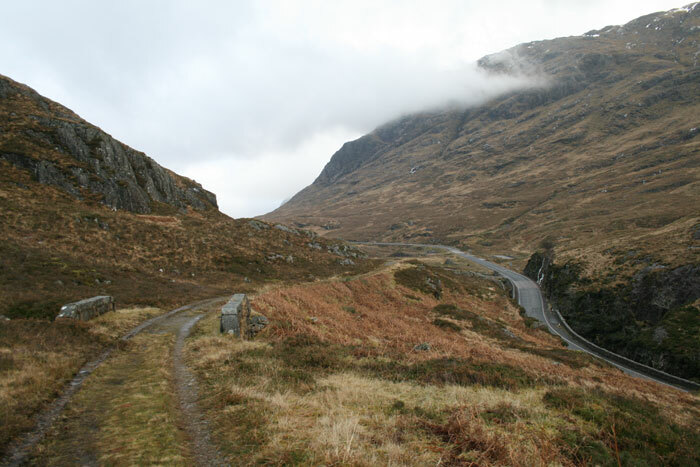 Another long gradient then lifts the road to its summit of 350m, before a series of straights and sweeping bends drop down to the Kingshouse, where the second iconic bridge crosses the River Etive. Before reaching the Kingshouse, the modern road crosses Telford's route by Blackrock Cottage where the Glencoe Ski Centre junction lies. A new road now provides access to the hotel, while another half mile further on the modern A82 finally assumes Telford's alignment at the Glen Etive crossroads. Here Telford's road joins from the east as the first section of the access road for Black Corries Lodge. For the next eight miles, the modern road either follows or runs alongside Telfords route. The variations mainly occur where modern (1930s) equipment was able to create a straighter and more level route than Telford had been able to a century earlier. Where Telford had followed the contours, wiggling along the hillside, before climbing round the many rocky obstacles that lie at the head of Glen Coe, the modern road builders were able to blast through the rock and create a much smoother route for modern traffic. The most spectacular section is where the road passes through the narrow rocky chasm known as The Study. Very short straights are linked by long curves curling round the rocky buttresses, with the river charging through the small area left for it, in places almost covered by the road. Even the wide section where the new bridge (built 2007) has provided a viewpoint for the waterfall is only half way, with the rock walls closing in once more before you are finally rewarded with the view down Glen Coe. Beyond The Study, Telford's road can be seen dropping sharply down the hillside to meet the modern road, behind a parapet wall, and within half a mile it has emerged on the left, running through the glen as a major footpath providing access from the car parking to the mountains on the other side of the glen. The two re-converge by the farm of Achtriochtan, passing Loch Achtriochtan as one. The short access loop forAchnambeithach is part of Telford's old road as it turns off to follow the River Coe into Glecoe village. Meanwhile, the modern road crosses the river (with a new replacement bridge opened in 2009) to sweep down the western flank of the lower glen and so bypass the village.